T2 mapping through variation of the T2 preparation (T2Prep) duration has been increasingly used to robustly detect and quantify cardiac edema (Giri et al., JCardiovMagnReson2009). However, if images with incremental T2Prep duration are acquired in a sequential fashion, irregular breathing patterns and heart rates may adversely affect the quality of the T2 maps due to misalignment of the source images. A logical alternative is then to acquire all images in an alternating manner (Figure 1ab), where the T2Prep duration changes cyclically from one heartbeat to the next. Combined with a radial signal readout, this may minimize the vulnerability to respiratory or RR variability. We therefore simulated, implemented and tested the utility of an alternating magnetization preparation approach to T2 mapping. a) Schematic of the alternating acquisition pattern. The T2Prep duration is alternated between 60, 30 and 0 (no T2Prep) ms from heartbeat to heartbeat. All images are acquired in an interleaved fashion and on average experience similar motion. b) Schematic of the conventional sequential acquisition pattern. The T2Prep duration is changed only after acquisition of an image. This approach may be more vulnerable to irregular heart rates or respiration patterns. 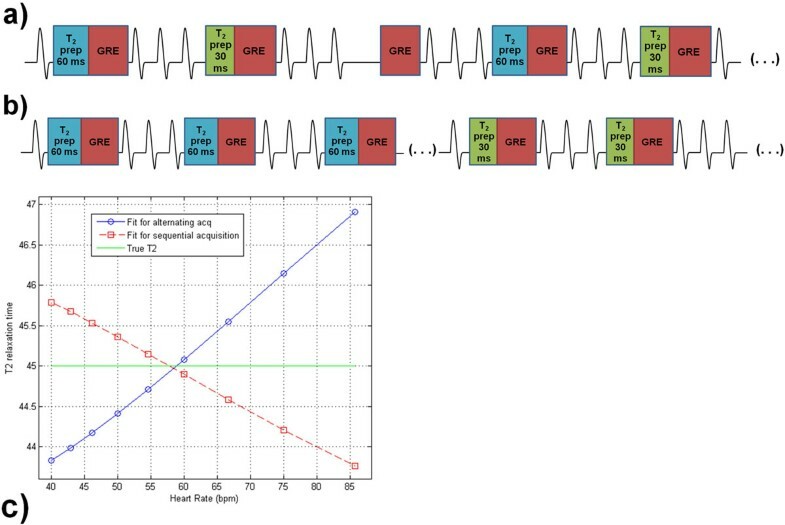 c) Simulations of stability of fitted T2 values for both methods against heart rate variation. For an input T2 of 45 ms, both the alternating acquisition (solid line) and the sequential acquisition (dashed line) result in a T2 variation of ~3 ms over the range of physiological heart rates. A navigator-gated ECG-triggered radial gradient-recalled-echo pulse sequence (20 lines per heartbeat, trigger every 3 heartbeats) was implemented to obtain source images for the T2 maps (van Heeswijk et al., JACCCardiovImag2012), with the possibility to apply the T2Prep durations of 60/30/0 ms in both an alternating and sequential manner. Bloch equation simulations were performed in order to estimate the fitting residual due to T1 relaxation (van Heeswijk et al., JACCCardiovImag2012) as well as the accuracy over a range of heart rates. The sequences were validated at 3T (12-channel surface coil array, on a Magnetom Trio, Siemens, Erlangen, Germany) in agar-NiCl2 phantoms by comparing the resulting T2 maps to gold-standard spin-echo (SE) T2 measurements. A mid-ventricular short-axis T2 map was then acquired with both pulse sequences in 7 healthy adult volunteers. The myocardial surface area was measured in the T2 maps, while a Student's t-test was applied to detect differences in T2 values and surface area. The alternating sequence was as robust to heart rate variation as its sequential counterpart (Figure 1c), while its accuracy was confirmed in the phantoms (T2 = 45.4 ± 0.7 ms for the alternating method, vs 45.3 ± 0.7 ms for the sequential method and 45.1 ± 0.7 ms for the gold-standard). The myocardial surface area was increased in the alternated T2 maps of the volunteers (128 ± 24 cm2 vs. 111 ± 20 cm2, p = 0.04) (Figure 2), while the average midventricular T2 value slightly differed between the alternated and sequential methods (T2 = 37.6 ± 6.6 ms alternated vs. 40.4 ± 6.1 ms sequential, p = 0.01). T 2 map of volunteer acquired with the alternating (a) and sequential (b) method. Note that consistent with the quantitative findings, the antero-lateral myocardium is thicker when acquired with the alternating method (arrows). We successfully implemented and tested a T2 mapping methodology in which magnetization preparation is alternated. The in vivo T2 maps demonstrate that the alternated acquisition intrinsically aligns its sources images, resulting in a larger available myocardial surface, which in turn may allow for more accurate T2 value quantification.